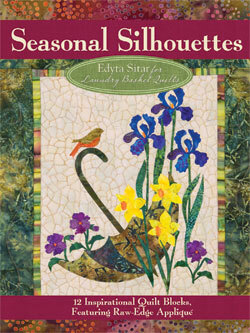 We absolutely love Edyta’s newest book, Seasonal Silhouettes. 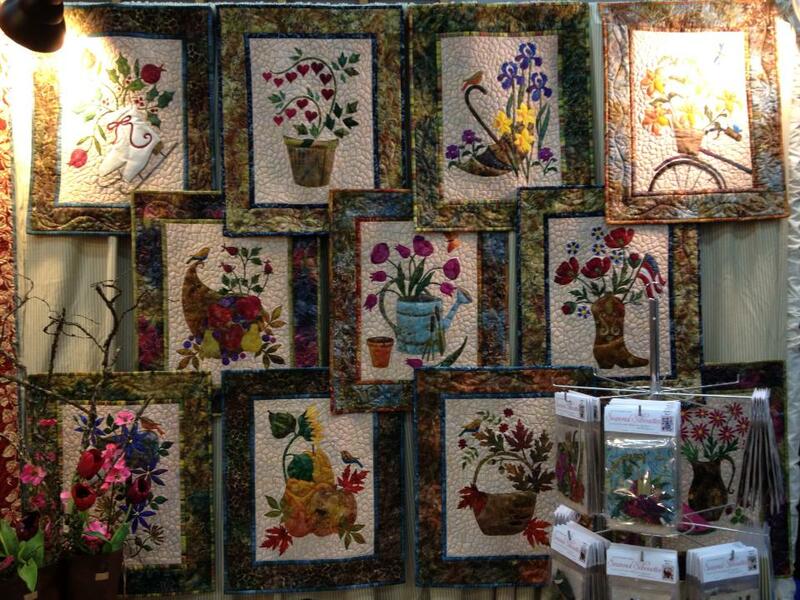 It is a collection of 12 inspirational quilt blocks that feature raw-edge applique. We will be giving away this book & some goodies at the end, so stayed tuned for how to WIN! Aurifil Threads – there are two sets that I really enjoy, one is my “Quilters Essentials” wt50 – it truly is a staple for many projects, the other is my 10 spool “Over the Rainbow” wt50 thread set – since it is a small spool set, it’s easy to carry when you travel and you can rely on the fact that you have a rainbow of thread colors no matter where you go. 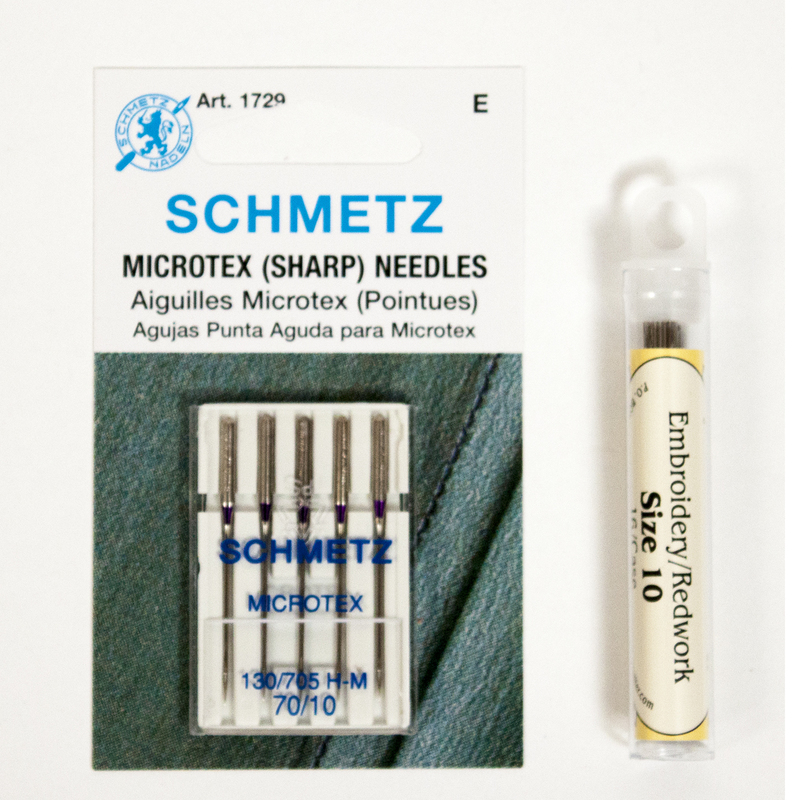 Needles – for machine I recently discovered “Schmetz Microtex Needles 70/10” thanks to my friends and I really enjoy them. For hand stitching I use “Foxglove Cottage Embroidery/Redwork Needle Size 10” I like them because of the bigger eye that makes them easy to thread but still nice and thin to slip through the fabric easily, perfect for binding. Scissors – my favorite ones are the “Gingher 5in Sewing Shear” these are a nice pair of medium size scissors that work great for any quilting activities. 2. Leave a comment telling us your favorite season. 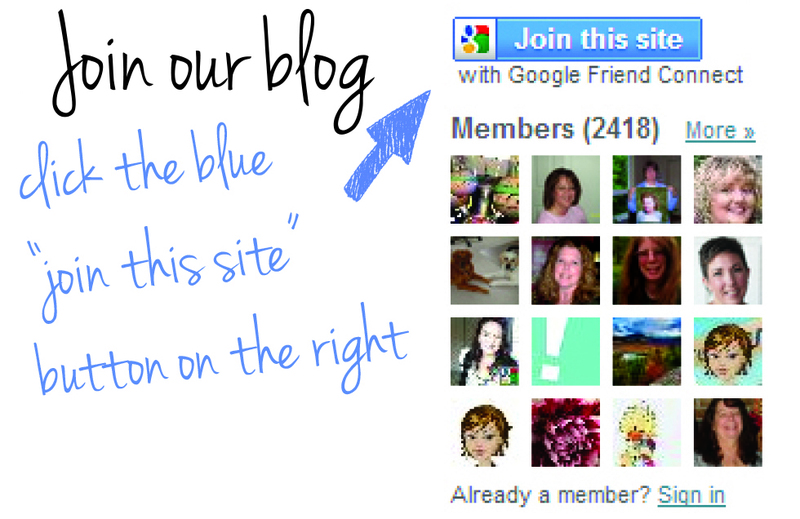 To follow our blog click on the blue button on the top right of this page that says “Join this site”. THIS GIVEAWAY IS OVER: THE WINNER IS MARY ANN. I’m already a follower and a fan of Edyta’s. Love her beautiful patterns and fabrics! My favorite season is fall when it’s cool, crisp, and filled with colorful leaves. Thanks for this wonderful giveaway! I already follow your blog. Thanks for the chance to win. My favorite season is spring. Thanks for the chance to win. My favourite season is spring because of the vibrant greens. I’ve been a follower also. My favorite season is spring – I look forward to the trees and flowers blooming after a long winter. I am a follower and I simply love everything about Fall!! Thanks for sharing the books and the great giveaway! My favorite season is autumn or fall. What is the right way to call it? Anyway, I love it with the changing leaves. I love Halloween since my daughter gets to dress up and I love handing out candy and watching Harry Potter. I also love Thanksgiving since that’s become the holiday I cook for. My favorite season is spring, sadly it is too short here in Alabama. We go from “our version of winter” almost straight into summer. Spring is my favorite season. Watching things grow and bloom brings me great peace and joy. My fav season is Fall! Love the cooler temps and the changing foliage, going from green to dark oranges, yellows to browns! Decorating with pumpkins, gourds and such. Love it ALL!! My favorite season is fall and I love the changing of the color of the trees. I am a follower. I just purchased my first Laundry Basket pattern and can’t wait to get started. I love her work…I would be over the moon to win this give-a-way. Thanks so much for a chance. I follow your blog and my favorite season is fall for the colors, the cooler weather, and football! I love the fall, after harvest, you can’t set back and enjoy the fruits of your labor. I am already a follower. My favorite season is Spring when nature presents a beautiful pallet of color. I am a follower. My favorite season is fall. I love the crisp air and the bright colored leaves. I am a follower of the blog. I love Spring especially ones that are cool and long! I follow your blog through Bloglovin. Fall is my favorite time of year because of the rust, red, yellow and brown colors. Plus Halloween is my favorite holiday. My favorite season is Autumn because I love the richness of the colors–the reds, yellows, and oranges of the turning leaves. I do follow.My fav season is Summer,love warm and sunny days. I follow you. I think Fall is my favorite season, I like the cooler crisp air, sweatshirts, sweaters, the smell of a nice campfire or burning leaves. And bugs are gone! My most loved season is Fall- the colors are vibrant, deep, and can be used to create beautiful hand-made gifts and décor items. The season of Fall touches all the senses and makes for some beautiful memories and moments. My favorite season is Spring because there is nothing prettier than when the wildflowers start blooming in Texas. My favorite season has to be fall 🙂 After the long, incredibly hot and humid Houston summers, fall brings such welcome dry, cool air (and the International Quilt Festival – yay!) Love it! I’m a big fan of Laundry Basket quilts. Hands down my favorite season is fall. I love everything about it! Thanks for the chance to win your wonderful give away!! I follow your blog via Blog lovin. I am already a follower of your wonderful blog! Autumn/Fall is my favorite season – I love those intense “autumnal earth” colors that mother nature paints across the landscape. Spring is my favorite season. It is like a reawakening of evderthing. Wounderful to watch it all turn green outside and come back to life…Thank you for the ehcnac eto enter your giveasway. The book looks fabulous. Those seasonal blocks of hers are just amazeing. My favorite season is Fall… I love wearing sweatshirts, drinking apple cider, raking leave (crazy, huh?) and of course, hometown football games. Fall time gets me outside enjoying the outdoors when I am not quilting :0)! Cheers! I am already a follower. I enjoy Autumn most of all! Fall has so many beautiful colors. I’m a follower. I love Summer the best. Road trips and fishing and flowers in the garden. Thanks for the chance to win~! I already follow. Love the blog. My favorite season is winter. Although I live in Florida where it is not likely to happen I love snowmen! I love Spring. It is so wonderful to see things come back to life after the rigors of Winter. I follow you in Google Reader & I’m hoping you’ll be moving to Bloglovin on July 1. I love SUMMER! It is such a short season in northern Wisconsin & I enjoy every day of it! Great giveaway – thanks for the chance. Love the spring when everything is coming back to life. I’m already a follower. There’s something I love about every season but fall is probably my favorite. My favorite season is Spring. I love when the weather warms yet it’s not too hot or cold. Plus the burst of color from blooms everywhere, and longer days makes for happy days to be out doors. I am already a follower through Google. I would be honored to win such a fantastic book. What a gift to treasure forever along with all the other goodies. WOW – thank you for the chance to win. Everthing a quilter would need and hope to win. I love summer. The longer days and the taste of homegrown vegetables. So darn good. I already follow your blog (And love it!) and my favorite season has to be fall. There is just something about the smell and the leaves changing colors that I adore. Thank you for the chance. Edyta is one of my favorite designers. I follow your blog. I am a follower and am currently doing the umbrella table piece. Absolutely love the coloration of these kits. Gorgeous!! Just figured out how to follow the blog. 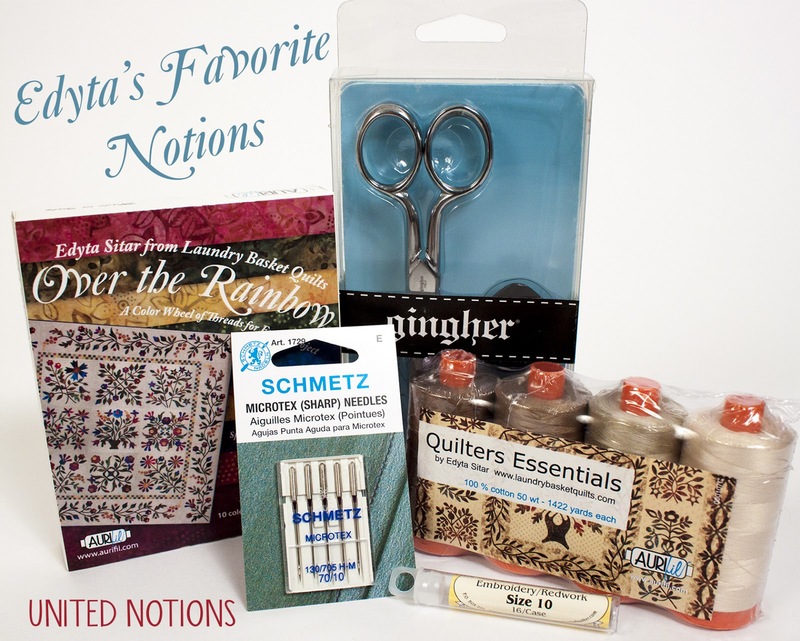 Thanks for the change to win Edyta’s new patterns and notions. I just became a follower. My favorite season is Spring. I love it when all the flowers and trees start blooming. I think it is the most beautiful time of the year. Love the blog! My favorite season is fall. I relish in the cooler weather after a hot summer, the colors and well orange is one of my favorite colors! my favorite season is fall when the weather starts cooling down from the hot summer. I have been a follower forever…love your blog! And learn so much! Edyta has such talent…all her books are outstanding. I think my favorite season is the one that I am in at the time…each brings such beauty and specialties…even winter in Iowa. I treasure each day and what it brings. Have a special day! I’m a follower…and I love FALL, because it is getting cooler and the change of colors. Thanks for the great giveaways. I’m love SPRING! The beautiful flowers, colors, and fresh air. I’m now a follower. I have been a follower for a while now! Always love to keep up with what’s going on! My favorite season is fall! Love the changing of the colors here in Colorado! Always a beautiful site!! I’m a follower now! Thanks for a chance to win. Spring is my favorite time of year. it’s a time for the new. New color, new sunshine, new time to do new things. Thank you for such beautiful work Edyta. My favorite season has always been fall. The colors, the smells, a hint of cool in the air. Such an easy question 🙂 my favorite season is Fall, it finally cools down outside, the color changes are wonderful and the fall holidays are my favorites. I follow you! love spring because of all of the flowers, fall for the turning of the leaves, and winter because I get to curl up in my quilt! Edyta’s projects are always so pretty! Thanks for the great giveaway. Love the peek into Edyta’s book. Wonderful designs as always! I’m a follower 🙂 My absolute favorite season is Summer. I love the sunshine and green grass and trees. We have about 7 months of winter so summer is always welcome! I am already a follower and love this blog! I am now a follower of the blog! My favorite season is winter! In the winter I can spend a full day sewing without feeling guilty that I am missing beautiful weather outside. I mean, I do spend days sewing in the summer, too, but I feel guilt about it in the summer! Definitely autumn–love the temperatures, the changing leaves, the slow down from a hectic summer and the anticipation of the holidays! I love fall. All of the rust, brown, orange, yellow colors. I love the new book ! I’am already a Dutch follower and always enjoy your blog! I’m already a follower and I would LOVE to win this giveaway! Here in Southern California the seasons aren’t well defined, but I do have to say that my favorite season is Spring. I follow and my favorite season is fall, it is so beautiful with all the colors and just the right temp. Thanks for the giveaway! I already follow and I agree with Edyta on the Thread and the scissors. These are a few on my favorites too, I do hope I win . Spring is my favorite season when everything is poping up new and renewed again! Lovely flowers rain showers. Thanks for the giveaway! Good morning from SW Washington USA, where we enjoy four full seasons, all perfect. Personal favorite, mid-autumn, when the falling leaves of the Cottonwood trees smell like heaven. I’m a follower. My favorite season is Summer. I love soaking up the summer sun on the beach, the ice cold sweet tea and the smell of chicken cooking on the grill. Thank for the wonderful giveaway. My favorite season is fall. Thank you for the chance to win! I follow your blog and love Edyta’s work! Thank you for a chance to win. I too follow this blog. My favorite season is fall except for raking those colorful leaves. My favorite season is fall – the leaves are changing into wonderful yellows, oranges and reds. The cooler days call for sweatshirts and the hot days of summer are over. I would love summer more if I had air conditioning in my house! I follow your blog and my favorite season is fall. I like that the heat is not so intense as summer, but it’s not so fickle as spring. I am a follower and my favorite season is ;of course Spring! I love the flowers and colors of Springtime! My favorite season is fall. I love the temperatures and that it signals the start of the winter holidays for me. My favorite season is autumn, I already follow your blog, thanks for the chance to win. My favorite season here is Fall as the colors are stunning and it means the beginning of the rainy season. When it rains there is nothing more wonderful and relaxing than watching the rain come down while quilting the hours away. Thanks for the chance to win. I already follow the blog. Although I hate the heat of summer I love decorating the house and exterior with red, white, and blue during July. I especially love the cowboy boot for this month also! I follow. My fave season is Spring. Everything starts new. Love the flowers. Thanks! I am already a follower. Thanks for the giveaway, great prizes! I’m already a follower here and my favorite season is autumn. Even here on the coast the air seems to bring something special that feels like promises of new life. Edyta’s designs are beautiful. I hope to try those machine needles she likes. Favorite season is Autumn. Love how the temps are perfect, the colors are so rich and beautiful. Craft fairs, pumpkins, mums, sweaters, leaves, comfort food and a everything slows down just a little. LOVE IT! I am a follower. 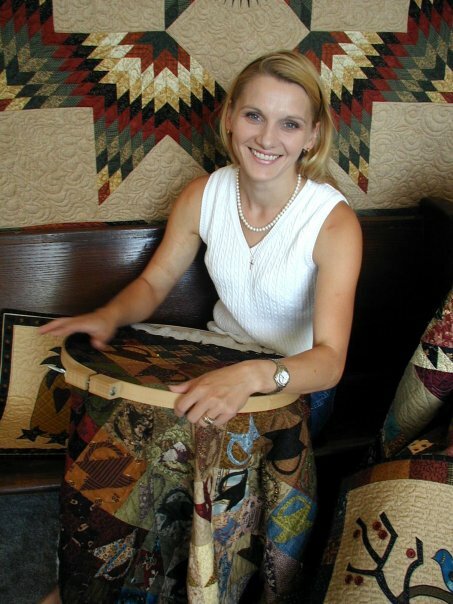 Edyta is such a wonderful quilt artist,her work is magic! My favorite season is Fall..thanks for great giveawway! My favourite season is summer: holidays with family, time spent by the sea, all of my favourite things. I’m already a follower. Thanks for offering this great giveaway. Since I live in New England where in October the leaves turn glorious orange, red, and yellow, my favorite season is fall. 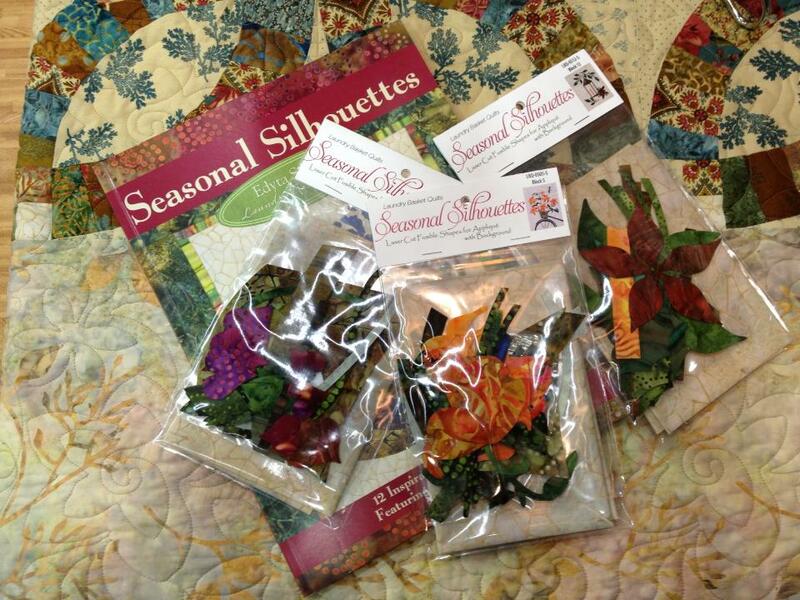 I am always drawn to autumn themed quilts and fabrics, whether pieced or appliqued. My favorite season is fall. I love the crisp air, and beautiful colors. My favorite season is Spring, when the earth comes back “alive” after Winter here in PA. I love the fresh greens and flowers that bloom in the Spring! I’m a follower and I’m so glad I am! These blocks are wonderful! I love Fall when all the summer’s bounty has been stored, the leaves are falling and the crisp air! My favorite season is spring because the weather is more pleasant for being outside. I love fall! Even in Texas, where we do’t get a lot of color, the weather gets cool and we can open the window and turn off the ac……it just feels great! Thanks for the great site and the chance to win! My favorite season is Spring with all the flowers blooming! Hope I’m a winner of this give away! My favorite is spring. Love these blocks!! Thanks for the chance! I love everything from Edyta! Thank you for the chance to win some wonderful goodies. Fall….I love the changing colors and the theme in general. I can never get enough of fall projects! I love Fall. Crisp air, harvest fairs, want to stay under a quilt. I follow your blog. I learn a lot from it. I love Spring. It seems like to me that is when everything comes to life. Nancy P.
I am already a follower 🙂 I love summer! It is so short here in the Yukon. I follow your blog ~ My favorite season is summer because I follow my Granddaughters in all their activities and have a wonderful time with them and their Mom and Dad. Thank you for the chance to win these awesome goodies. I am a huge fan of Edyts’s and her beautiful designs. My favorite season is fall when the air is crisp, nature shows off gorgeous colors, and the smell of apple cider warms the heart. I enjoy your blog, nice to follow. I am now a new follower and my fingers are tightly crossed for your fabulous giveaway. I LOVE Spring! I love the spring with all the beautiful colors. I love winter – the crisp air, holidays, pumpkins, and tons of beautiful snowflakes. My favorite season is Spring. Here in the California Central Valley, all of the fruit trees come into bloom and the valley is alive with color. The weather begins to warm up and the air is fresh. I use to love the Fall season, it’s beautiful colors and fresh air. However as I get older, I am beginning to favor Spring. It renews my spirit and encourages me to look forward to the new beginnings in life. Thanks for the opportunity to win such wonderful prizes! I’m already a follower. Without a doubt, fall is my favorite season. The colors here in Virginia are AMAZING, and the cool breeze feels fabulous after a long, hot summer! i love summer best of all. I adore the autumn season – the cooler crisp air and the colors of fall make it my favorite time of year! Love all of your work! Can’t say I have a favorite season….they all have something wonderful about them. The newness of spring, the warm summer, colorful fall and hokidays of winter! Your patterns capture them all beautifully. Would love to win the giveaway! Keep the beauty coming! Love Edytas patterns. Im already a follower. My favorite season is fall. Thanks for the chance to win. My favorite season is Spring! It is amazing I have followed by email for a long time and I guess never joined GFC. I am glad for the reminder. Her book is beautiful! Followed! Fall of course….the beauty and color that God gives us cannot be duplicated in any other way! I am a follower of this blog. My favorite season is Fall. I love the notions and own the gingher scissors,they are great. I am already a follower. This is such a great prize package. My favorite season is spring. I don’t like the cold, so I am always anxious for the warmer weather. Fall is my favorite season – orange being my favorite color – it fits. I am now a follower but I have been a fan for a long time. I have already completed some of your other projects. My favorite season is fall but I love the pattern with the skates. Thanks for the chance to win that amazing prize. I am a follower and I love Fall! I am a new follower and very excited about Edytas new book-would love to win it but know it will be in my quilt library no matter what!! Fall is my favorite season-love all the colors related to Fall! I still love all the colors of fall the best! and the Indian summer sunsets!!! I also follow your blog :))) My favorite color is Moda too! I follow this blog already. I love the colors in Edytas work. So pretty. Fall is my favorite season of all. My favorite season is Spring…all the Bluebonnets and Indian Paintbrushes along the highways in Texas! Just beautiful!!!! Great giveaway! My favourite season is Spring! The freshness of the new growth and beautiful blooms! I live in Florida, so my favorite season is winter. The winter is very mild. I love all of the Laundry Basket designs. I am currently working on Spring Bouquet. I love how each block looks when I finish them. My favorite season is spring…after the snows of winter the flowers are blooming and the grass returns to green. I follow by e-mail. Does that count? My favoutite season is Spring – so much promise seen in the burgeoning plants and flowers. I already follow your blog….Love it!! My favorite season is Winter….love the holidays and snow, snow, snow! I love fall. Put on soups & start crafting for the holidays! I so enjoy Edyta’s work. I’m a fairly new quilter and would love this package so that I could try her techniques. I just joined the blog. I love, love summer! What a beautiful book and wonderful prizes!!! My favorite season is autumn. I love the cooler weather and the colorful leaves, mums and pumpkins, plus my birthday is in October. I have now become an official follower, but I have been reading your blog for quite some time. I have been following the blog for quite some time and really learn so much. Thank you. My favorite season is Autumn after a really long and hot spring and summer in Tucson. My favorite season is Spring – love, love, love it. I am looking forward to trying the notions that has been suggested. My favorite season is Autumn. I love Edyta’s designs. Thanks for the giveaway! I’m a follower who loves fall. Thanks! Oh I already follow your blog and certainly glad to…My favorite season is Spring..it is not to hot or cold….I don’t mind the rain because it makes the pretty flowers and trees and grass even richer in color. The book looks wonderful and would really enjoy winning it. Thanks for a wonderful give a way. I’m already a follower of your blog. I love Edyta too. I would love to win her book and tools. Fall is my favorite season. I love fall and Edyta! Love Edyta’s designs.. My favorite season is Spring as I love the rebirth of nature. I have always loved winter. Something about the overcast weather makes me think of sitting in front of a fireplace and reading a good book. My favorite season is Fall and Spring is a close second. I am also a follower of your blog and receive email updates as well. Thank you for the chance to win some wonderful prize and experience a new method of art! My favorite season is Spring as well. Thanks for the chance to win! I’ve followed via email for months, but ok, I did the Google thing too. 😉 I love fall and I absolutely hate summer. I am already a follower and my favorite season is Autumn. I already follow you–get your blog in my email! My favorite season is fall–the rich colors, the changing light, the smell and crunch of falling leaves, the taste of apple cider. I’m already a follower. Fall is my favorite season – warm days, cool/cold nights & college football. Thanks. Such a lovely give-away! My favorite season is spring. I love the new flowers and all the new green! Thanks! Fall is my favorite season. I live in a place where there is lots of color in the landscape and it’s fabulous! It’s so difficult to choose just one season, as I love them all. But, if I had to choose, I guess it would be Spring, a time for renewal and new birth. I’m already a blog follower and look forward to reading it. Thanks for the giveaway, some of my favorites, also! I’m a follower who loves Fall – but I have to say that living in Atlanta I really miss the colorful leaves of New England where most of my family lives! Fall! Because I love orange and black, pumpkins and fall leaves, apples and cider, and Halloween and Thanksgiving! Fall is my favorite season….love the fall colors. Would love to win The fabulous book!!! Thanks for the giveaway! HAPPY TO FOLLOW YOU VIA BLOG LOVIN’,GFC AND FB. HELLO! REALLY LIKE AUTUMN>THE CRISP COOL AIR AND FALL COLORS! It is a toss up between Fall and Spring. I love the colors and smells of Fall. But I love the freshness of Spring. I already follow this great blog. My favorite season is the fall. The colors, the food, the weather, the smells…what’s NOT to like?!?! Hope I win-thanks for the op! My favorite season is summer even though it can get into 100 plus! I already follow your blog. My favorite season is Autumn, with Winter a very close second. Edyta’s book looks super. I love spring because everything blooms! Fall is the most beautiful season….love it. Already a follower. And I am drooling. I love Edyta Sitar and I love applique. I hope my name is a winner. Thanks for the opportunity. Each season has its advantages, but I really love the colors and scents of spring. Lovely patterns and a lovely lady. Had the privilege of meeting her in Paducah. I’ve always chosen fabrics in the fall colors, they’re my favorite. I am a follower plus I get your blog in my email. I don’t want to miss a thing. I love Edyta’s designs. I actually did the quilt from her Hop To It book. Thanks for a chance to win some awesome stuff. Spring is my favorite time of the year because I so look forward to seeing color again. My favourite season is the fall with nature putting on the most beautiful colors! My favorite season is fall. I love the cool, crisp air that turns warm during the day. The smells of fall are wonderful, but the colors are fantastic! I am a follower and my favorite season is fall! Thanks for the chance to win! My favorite season is spring with the promise of warm weather, sunshine and green plants. I am a follower and my favorite is Spring !! I am a follower who loves Summer the best! I also love all things Edyta! It is my desire to one day produce quilts that look just like Edyta’s quilts. Following now…I love spring after the long cold winters. Thanks for a change to win. I love them all of course, but summer is my favorite. Love the HEAT here in So Cal – warm breezes, everything in bloom. Long days. Yep. Summer. Spring is my favorite season. I love watching the flowers and plantings bloom. I love each and every season, so it is hard to pick just one. I am grateful for the smallest changes that nature provides each day. Maybe, if I had to pick, though, it would be spring. I love the smell and feel of the earth as I set in new seeds and flowers. I love the baby rabbits even though they are eating away all the seedlings, and the feel of the sun, which is not too hot yet. My favourite season is Autumn (Fall). I love how the leaves all change colour. I am a follower. Thanks for the lovely giveaway. I am already a follower!! Yay!! This is a wonderful giveaway – love those seasonal silouettes!! Thanks for the chance!! Fall, hands down. The crispness of the air after muggy southern days. New school tools always meant new crayon box. Now my adult crayon box is fabric and other fibers. But the fall sort of rejuvenates the call for lap quilts, then bed quilts, as if I need a reason to quilt! Been a fan of Edyta’s ever since i took her Broken Star class last year. My favorite season is summer with sunny days, good times w family, picnics, and events by the water. Fall, hands down is my favorite season. Thanks for the chance to win some goodies! I am Edytas biggest fan! I love the spring when the colorful flowers start to bloom, but I also like the fall with the changing colors of the leaves. I love spring the very best! I am a follower. Fall is my favorite season. Wonderful giveaway. Love the blocks, so pretty! I’m already a follower. The fall is my favorite, because here in AZ the summer is hot, that it nice to have the cool down. I joined your blog. And my favorite season is autumn! Thanks! Springtime, it’s coll, blooms are everywhere and gardening is easy. I love Fall! Thank you for the opportunity to win. I am following your blog and my favourite season is Autumn. I love spring with it’s promise of new life. Thanks for the chance to win! I love the fall because you get to bundle up in all sorts of warm clothing and then you get to pile on the quilts. Summer is my favorite time of year. I love hot weather, and all the colors that summer brings. I also love fresh veggies from the garden. My favorite season is Fall. I seem to come alive with the cooler days and longer nights. Think I just followed your blog again. May be a duplicate. I’m now following on GFC also. My favorite Season is Fall. I love the cooler weather and the gorgeous leaves changing colors. how awesome, I already follow your blog… I love each season as they are all different , but I think Spring is my favourite…. Fantastic blocks…. they look beautiful…. I have been following Edyta since the beginning. She is a lovely person and fantastic teacher. Each season has it’s own beauty and advantages. From the coldest day of winter when I can curl up with a book while wrapped in a quilt, to the hottest day of summer with ice tea and a new quilt book or magazine. I’m a follower – thanks. I am a follower. I love fall, because of the cooler weather. Thanks for the giveaway! Hard for me to choose between spring, fall and winter. I’m not a warm weather person so summer is my least favorite. Fall because I love the crisp, cool air after a hot and humid southeastern summer. I love the changing leaves. Winter because I love to feed the birds and watch them in my yard. I love the holidays. And finally, Spring because nature comes alive again! I love Fall. In New Mexico, the days are warm and the nights are crisp and oh my. the aspens are golden, the hot air balloons are prolific, and the green chile is roasting. Thank you for the giveaway opportunity. The book is fantastic, I would love to own it! I am a follower of this bog. Love it. I’m a loyal follower of your blog already. I am a follower and I love Edyta’s work. This is lovely – I’m such a fan of flowers. Summer! I love Summer! The vibrant colors of nature and the Beach…especially the beach! I love Edyta’s beautiful work! I think I like the fall season the best. The leaves, the pumpkins, the cool weather…. Thank you for the chance to win. I am already a follower, and my most favorite season of all is definitely FALL! The colors are so rich and saturated, the air so crisp and the promise of the holidays are right around the corner. It’s fabulous! Fall is my favorite season. I have found that I have more fall and Halloween projects that I have made than any other. I have joined as a follower. I’m a newbie to this blog and an an eager learner. My favourite season is spring because of it’s promise of new possibilities. I try to approach every day like it’s the first day of spring and that anything is possible. I’m a follower already. I love Spring and the color it brings after a long winter. I love Fall! Especially the beginning. I live in the desert and I love how crisp the mornings are before it starts to heat up. Oh what a great give-a-way,Spring is my favorite. I love fall. The air is so crisp & clean. I am a follower and my favorite season is Autumn. I love the cooler Fall air and the beautiful colors of the sugar Maples in my yard. We go apple picking and grow/buy pumpkins. My favorite season is winter. It’s not too cold here in Central California but nice weather to stay inside and quilt. Too cold to garden. My favorite time of year is spring. I love all the new growth. Of course, I’m a follower! I follow your blog by email, and now Google! My favorite season is definitely Fall – warm days, crisp nights, beautiful colors, etc. Thanks for the peek into Edyta’s favorite notions! Edyta’s work is beautiful, just like her. Have always loved Autumn and Spring for the obvious reasons, but when Autumn arrives I think I love it a little more that is until Spring arrives then I think I love it a little more. Thank you for a very generous giveaway. I follow your blog and I love Fall-the colors, the weather, the FOOD. I love fall when I lived in Maine, now that I’m in Texas I like spring. I love Spring. I love that everything is coming back to life and has so much potential! I like somethings about each of the seasons, especially that they change, but my favorite is fall. I love the cooler weather and the colorful leaves and even the cleaning up of the gardens. I love every season but would say that spring is my favorite. I love the spring colors and the feeling of a “new start”. I love fall. It’s a better time to grow vegetables here in the South than in the spring. I love the cooler weather after the long, hot summer. It’s gotta be Fall. The sights, sounds, smells and feel of Autumn. Those reds, oranges, and gold colors are beautiful. The sounds of leaves crunching and Geese flying south immediately come to mind. Pumpkin bread, Apple nut cake, and bonfires are the smells of the season. The woolen sweaters tug at you and those quilts make the season feel complete. Yep— It’s gotta be Fall. I am a follower! Yikes, my favorite season!!! I love each of them for the uniqueness and beauty that the season offers. I love winter for the snow and the quiet, a season of renewal. I love Spring! All the flowers and trees come to life and the colors of nature burst forth…..everything smells so sweet! My favorite season is spring…everything is new again!Faboulous giveaway! Spring is my favorite. All the flowers speak of renewal. I’m a follower! My favorite season after six months of winter in MN, is now Spring! My favorite season is fall. Thanks for the chance to win! I won an Edyta Sitar book and it’s awesome, and I bet this one will be also! Love the bright vibrant colors of summer! I love fall ~ the colors, the food and the change of seasons. Thanks for the chance! I follow and SPRING is my favorite season! I am a follower of your fabulous, fun blog. I have a hard time choosing between Spring and Fall, both have such a crisp clean feeling in the air that I love. Hi!!!! I am a happy follower!!!! I’m already a follower, and I love the warm temperatures and water fun of summer. Thanks for the awesome giveaway! My seasons in order of favorites are Spring, Fall, Summer, Winter…They all have their moments!!!! Wonderful giveaway! I love Edyta’s books and patterns. Spring is my favorite season, pleasant days and cool nights – perfect. I love all four seasons, but my fave is autumn – those rich colors, the smell of burning leaves, cozy sweaters, pumpkin pie. I’ll take autumn any day! Autumn in Minnesota can’t be beat! The days are cooler with less humidity, the insects have left town, and the trees turn all those beautiful colors that have inspired many a quilt! My fav season by far is Spring! I’m already a follower! My favorite season is anything but summer! It’s so dang-blasted hot here I dread it! My dogs hate it, the chickens hate it, the garden hates it, you get the drift! LOL! 2) I adore Fall, the colors and the cooler weather! My favorite season is Spring. It starts to warm up and all the trees and flowers start to bloom. I Love Fall the feel, smells and beautiful colors. I also love bonfires, apples and cider. I already follow your posts.Thamks for tithe great giveaway. My favorite season is fall, such a relief from the heat here in the south. I’m a big fan of Edyta! Just completed Spring Bouquet! Never thought I would ever have a beautiful project like that. Edyta makes it all so doable. Favorite season would be fall, love to wrap up in warm clothing and quilts and the colors of fall are amazing! I follow the blog, and am a huge fan of Edyta. Thanks for the chance to win! My favorite season is Spring because nature comes back to life after a long hard winter. My favorite season is winter. I love snow and skiing. I just love love her designs as they are just that bit different to many others. I already follow your blog and my favourite season is summer, mostly because I hate being cold! Love all of the quilts in this collection, especially the cowboy boot! I am a follower and fan! My favourite season is Spring – I love to see the garden burst into life, yet everything is still manageable. I have been a fan of Edyta’s work for awhile now. I love the quilts she produces! My favorite season is autumn. My favorite season is fall. Thanks for the chance to win. I am a long time follower of the Cutting Table and the Laundry Basket. Luv them both!! My favorite season is def summer as I hate to be cold! I love the heat!!! Thanks for a great giveaway. I follow the blog on theoldreader.com! I love summer because it’s hot and I’m always cold. Plus – you can eat ice cream at any moment, and have it be ok. I love fall! The weather, the clothing, and colors. I am a follower and my favorite season is Spring. I love to see all the colors as the flowers start to bloom and the grass turns green. My favorite season is spring and then summer. I love seeing all of nature coming to life in the spring. Thank you for this great giveaway. I am a follower of this great blog! I follow through Bloglovin 🙂 This is quite the treasure chest of giveaways! Thanks for the chance to win. I just became a follower, tho I’ve read your blog for a long, long time. My favorite season is spring- actually, the time period the screen can be put in the front door, and the door left open. Thanks for letting us know about Edyta’s most recent book. I’ve long wanted to make small quilts for each month, so I think I’ve just found the pattern to use! Autumn is my favorite season by far. I love the fruit that comes into season, the crispness in the air and the colors of the trees. Your color palate reminds me of fall! I’m already a loyal follower! Definitely love fall because of the cooler temps and beautiful colors. Thanks for the chance to win. I love winter. I love taking in a breath of ice cold air and seeing how peaceful everything looks with a fresh coat of fluffy white snow or thin layer of glistening ice. I am a follower. I love late spring and summer. I can tolerate heat better than cold. My favorite season is summer! More daylight, warm temperatures, lots of fresh garden produce – a slower pace – love, love, SUMMER! I follow your blog already! My favorite season is spring, I love all the colors in the flowers that are blooming then. I follow your blog on bloglovin 🙂 thanks for the giveaway and great posts! Fall is my favorite season, love all the great colors! WOW! LOVE LOVE LOVE the new book by Edyta! Oh my gosh she is so talented. My favorite season is fall and my favorite block from the book is Sept. Baskets and flowers are two of my favorite things. I am already a follower and my favorite season in Spring when Mother Nature throws off her wintery snowy blanket and brings her beauty once again for us to see and enjoy! Autumn is my favorite season. The air is cool and crisp and the colors are beautiful with the changing leaves. My favorite season is Fall. I love the changing colors and the crispness in the air. I’m a follower already. Thanks for the chance to win. Spring Is my favorite season. Wonderful sunshine and showers, love the rapid changes. I love winter- slow time, quilting time, watch the snow fall time. I am already a follower. My favorite season is autumn. Love the colors and the scents in the air. I love the Fall–mainly the cooler weather and the beautiful rich colors! I am a follower. I love summer because it’s pretty much the only time we get some nice weather. Although I love the colors of fall. I love all the seasons and it’s hard to choose a favorite. I’ll say fall! I like winter because it has Christmas! And I love red and green! My favorite season is spring. I love to see everything finally coming into a new life! Refreshing!!! 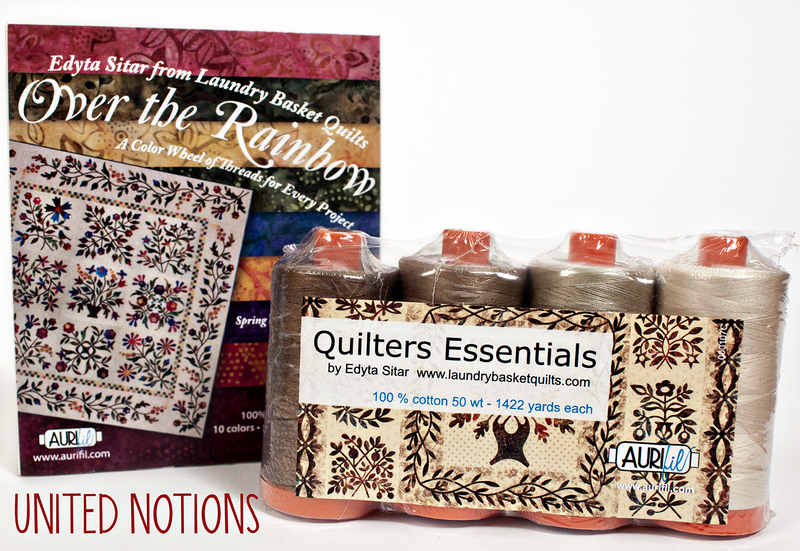 I would love to win as I love Edyta’s patterns, and of course, you cant have too many notions or Aurifil threads. Yes I am an Edyta fan and yes I follow your blog. But Mr Moda I have for a long time and I love your stuff but I never win but I will try again…. My favourite season would have to be spring, when it’s not too hot, not too cold and everything old is new again! Just gotta love new beginnings! I’m a follower, too 🙂 Please count me in! I love Autumn – a final KABLOOEY of flowers and colors, chilly nights and snuggly warm quilts – Yep, absolutely my favorite season! Thanks for the chance to win this great prize. I now follow your blog but is funny as I planned to earlier as I finally got around to watch The Quilt Show with Alex and Ricky and saw your show and it was awesome!! My favorite time of year is Fall. I loved how you showed the seasons on Alex and Ricky’s computer show….The Quilt Show. Thank you and I hope I can get in on a swap sometime. I enjoy both spring and fall, a time when I can shut off the air or heat and just enjoy the weather, birds chirping and nice weather! Thanks! I follow your blog. My favourite season is autumn. Sunny days, cool nights and mornings, beautiful leaves. Unfortunately it only lasts about 6 weeks where I live. I like winter because I love to ski and summer because of all the beautiful flowers. Every season has it’s own special aspects–I don’t want to give any of them up! Can’t imagine trying to escape winter by moving to AZ for the duration! Gotta enjoy them all! When I first starting quilting (in 2010)one of the first professional quilters I was introduced to was Edyta Sitar via “The Quilt Show.com” I instantly something gelled and I remain a faithful fan. I love her style and love many of the same products that she uses. Now that I am a confident beginner quilter I am now ready and prepared to begin one of Edtya beautiful projects. I loved to win these amazing prizes. Julie Beard, Adelaide, South Australia. My favorite season is fall. Love fall colors and weather. My favorite season is Spring!!! The rebirth of everything beautiful! I’m a follower 🙂 My favourite season is summer, for the sunlight and warmth! My favorite season is spring. The flowers and trees bloom, the air is fresh, and the birds return to my feeders. Thank you! My favorite season is Fall. I love the harvesting, the change of the leaves and the cooler weather. I love the warm colors of fall. It is such a relief from the long hot summer. I love the fall. Crisp cool air and beautiful colors. Fall is beautiful with the leaves changing, so colorful. I believe that spring is really my favorite with all the new green followed by the beautiful colors in the hills and spring flowers.